Today, April 1 – April Fool’s Day – the power of collective action has trumped the fools, killers, and thieves in the Honduran government. Gustavo Castro Soto is back in San Cristóbal de las Casas, Chiapas, Mexico, with his family. His return marks the end of 24 days of captivity in Honduras – first in the custody of the government, which subjected him to psychological and physical torture, and then in the haven of the Mexican Embassy, because the Hondurans prohibited his departure. Gustavo was both witness to, and twice-shot victim of, the assault that killed global social movement leader Berta Cáceres in La Esperanza, Honduras, on March 3. The Honduran government could not stand up to the international pressure from the US Congress, Inter-American Commission on Human Rights, Vatican, and many other sources of pressure and denunciation. More than anything, the power of the fraudulently elected regime could not trump that of citizens around the world, who held rallies, sent well over a hundred thousand letters, and committed themselves to continue organizing until Gustavo was freed. The government capitulated yesterday and gave Mexican activist and writer permission to return home. However, it mentioned that it may demand his subsequent return to help with the investigation. This morning, Otros Mundos in Chiapas wrote to us, “What still remains is guaranteeing security for his family and the team.” We hope you will remain with us, mobilizing the power of people united, until Gustavo; members of the Civic Council of Popular and Indigenous Organizations of Honduras (COPINH) – the organization that Berta founded 23 years ago this week; and all Hondurans have security and democracy. To use a favourite term of Gustavo’s: ¡Animo! Let’s do it! Gustavo Castro Soto is beloved by movements throughout Latin America, and not just for his political organizing prowess and strategic brilliance. His together-we-can-do-this attitude, easy gap-toothed grin, and quick humour draw people into what otherwise could be overwhelming leadership. Gustavo – like his dear friend Berta Cáceres– is a fomenter of the collective imagination that says that we can re-envision and build just and humane political, economic, and social systems, that we are not condemned to live in the worlds we currently have. Under Gustavo’s guidance, Otros Mundos – which is also Friends of the Earth Mexico – has become a focal point for environmental defence throughout Mexico and Mesoamerica. The group organizes impacted peoples and their allies for campaigns around water, energy, foreign debt, and climate crisis, amongst other issues. It also connects and mobilizes activists for effective action toward economic and environmental alternatives. Gustavo is an electric light switch – solar electric – sparking and connecting currents across the region. He has founded and coordinated many Mexican and transnational social movements to build the power of united people. In addition to Otros Mundos, Gustavo co-founded Other Worlds; the Mesoamerican Movement against the Extractive Mining Model (M4); the Latin American Network against Dams and in Defence of Rivers, Waters, and Communities (REDLAR); the Mexico-based Movement of Those Impacted by Dams and Defending the Rivers (MAPDER); the Mexican Network of Those Impacted by Dams (REMA); the Convergence of Movements of Peoples of the Americas (COMPA); the Network of Alternative Sustainable Family Networks (RESISTE); and the Popular School for Energy and Water, where communities throughout Southern Mexico learn about environmental alternatives; among others. In times past, he founded and coordinated the Institute for Economic and Political Research for Community Action (CIEPAC) and, together with Berta, the Yes to Life, No to IFIs [international financial institutions] campaign. He served on the coordinating committee of the World Bank Boycott and the board of the Centre for Economic Justice, amongst many other affiliations. On the refrigerator in Gustavo’s home hangs a drawing of him with a computer substituting for his head. A sociologist, he pounds out analyses of neoliberalism, of the devastating impacts of dams and mining on the earth and people, and of the need for a profound transformation. With his high-speed brain, uncontrollable grey curls, frumpy clothing, coffee, and cigarettes, Gustavo is the archetypal Latin American Bohemian intellectual. Yet he doesn’t spend his days in discussion with a left academic elite, but rather with campesinos/as and indigenous peoples in mountains and villages. Gustavo’s focus has been on popular education, ensuring that those directly impacted by the problems have the information and understanding they need to be effective change agents. He has strongly encouraged the academy to become more socially engaged and useful. Another drawing of him could just as accurately show a heart on top of his neck. He constantly welcomes friends to share a meal or stay for a week in his home, where he is tightly surrounded by the partner and four children he adores. He has friends and fans throughout the world, of whom an especially close one was Berta. Motivated by compassion, Gustavo worked for years with the most resource-poor and exploited indigenous and campesino people of southern Mexico and Guatemala, seeking both economic and social justice and an end to state-sponsored violence against them. Beginning in the mid-1980s, Gustavo worked for years in refugee camps with Guatemalans who had crossed into Mexico seeking refuge from the war. Throughout the mid- and late-1990s, Gustavo accompanied Mexican indigenous communities who were harmed by the state violence that surged in response to the Zapatista uprising. 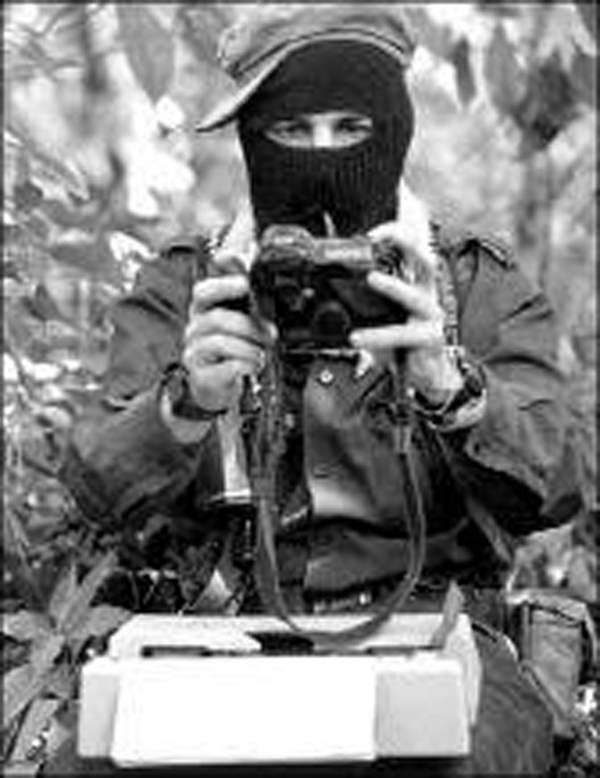 He was a key part of the peace negotiations between the Zapatistas and the government, through Bishop Samuel Ruiz’s National Commission for Mediation (CONAIE), which launched in 1994. My wounds hurt me terribly, although they are healing. But my greater pain is for my dear Honduran people, who don’t deserve this; none of us do. We’ve always admired this noble, brave people who are fighting for a dignified life for all, without distinction and with justice. That was Berta´s struggle. I feel love for this beautiful country, its landscapes, its nature, and especially its people. We should not let murders cloud our hope or landscapes. Berta meant a lot to me, as much as she meant to you. Berta was an exceptional woman who fought for a better Honduras – more dignified, more just. Her spirit grows in the heart of the Honduran people, because we didn’t bury her, but sowed her so that she can grow hope for us. Soon there will be justice.